Shovel Knight will go down in history as one of the more successful Kickstarter video game projects ever attempted, blasting through its minimum goal of $75,000 to hit $311,502 before Paypal, which passed 12 separate stretch goals, some of which are still planned on being implemented. Receiving huge critical acclaim following its release in June 2014, the game went on to win multiple awards, including best independent game at The Game Awards. It seems Yacht Club have unearthed a real classic with Shovel Knight, and now that it’s out in the EU as of November 5th, we can finally dig in too. 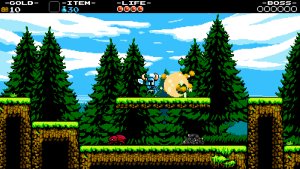 The first thing you’ll notice when you load up Shovel Knight is its intense NES charm. The game screams nostalgia in the first few moments and continues to show off its antiquated aesthetic throughout, although without the predictable bugs, frame rate drops and freezing many associate with this era. 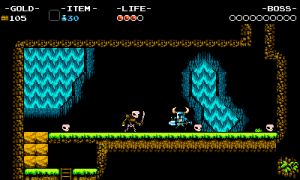 Sean Velasco, founder of Yacht Club games has listed several historic video games as direct inspirations for Shovel Knight, including Castlevania III, Ducktales, Super Mario Bros. 3 and Megaman as the strongest of these. These influences are clear as you play, such as the themed stages leading up to a boss, akin to the robot masters in a Megaman game, or the limited control offered by a 2D Castlevania title, delaying your basic attack and having you rely on items to hit enemies from above or below. 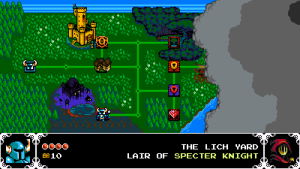 The game has been widely accused of being highly difficult, often compared to Dark Souls, for more reasons than one, Velasco has stated that he intended Shovel Knight to offer a “balanced difficulty that works for all players” although many gamers inexperienced with 2D NES era games will find themselves seriously tested. The game continues to adapt its difficulty, always presenting you with fresh new challenges, stages never feel repetitive, making diverse and striking use of alternate colours, layouts, enemy designs and solutions. This really comes to shine in the boss fights, many of which are completely gorgeous, looking and feeling wonderful to play. Velasco mentioned that he wanted to avoid making the game “Nintendo hard” or including “random cheapness” to the game, although many would argue that this is exactly what the player is faced with in the later stages, with Polar Knight and Propeller Knight’s boss fights using spike floors and introducing holes in the floor, both of which will mean instant death if you land on them, or are knocked into them by the otherwise entertaining boss fight. Even the final boss is more forgiving with her attacks that remove the floor, giving you plenty of room to manoeuvre. The game is filled with all kinds of polish such as the array of optional bosses, challenges and events that occur on the world map, these extra stages or side bosses add a refreshing distraction to the game’s stage based structure, allowing you to experience a lower difficulty challenge with usually high rewards to break up the tension and difficulty of the main game, which is really satisfying. Although unfortunately there are quite a limited amount of these events, and they aren’t random, occurring automatically after certain stages are completed. Another problem is there is a very limited selection of things to spend your money on, this becomes even more obvious at New Game + when the same vendors cannot offer you anything new. When you die in Shovel Knight, a portion of your money floats about the area where you died in up to 3 floating money sacks, the challenge here is to fight your way back to where you died and collect your money again, Dark Souls anyone? This can be made easier with the fishing rod, although this is sometimes impossible, given the nature of your death, we’re looking at you, ceiling spikes. This can be very frustrating, especially when there’s no way to retrieve what you’ve lost. This gives you a reason to try and spend your money before entering dangerous stages, although as previously stated, this isn’t possible after a certain point. This system works perfectly in Dark Souls, where money can always be used to level up, giving you small advantages to your character. But it’s not all frustration, the music for the game is superb, and the clever way that the game uses bard pages as rewarding treasures means that you can collect the music, to be played whenever you want, making the music a bigger, more relevant part of the game. 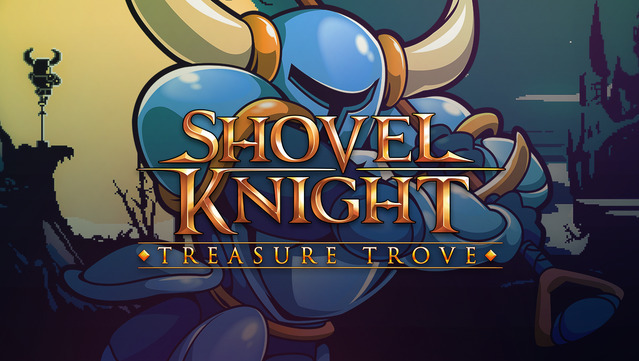 Overall Shovel Knight is a really fun experience, for the right kind of player and is a wonderful game given its tight and highly demanding Kickstarter schedule. So if you haven’t played it yet, stay tuned for the DLC, much of which will supposedly be free, available later this year. – Probably some of the best 8 bit graphics and sprite animation out there. Nintendo 3DS Review - Gaming on the Go!